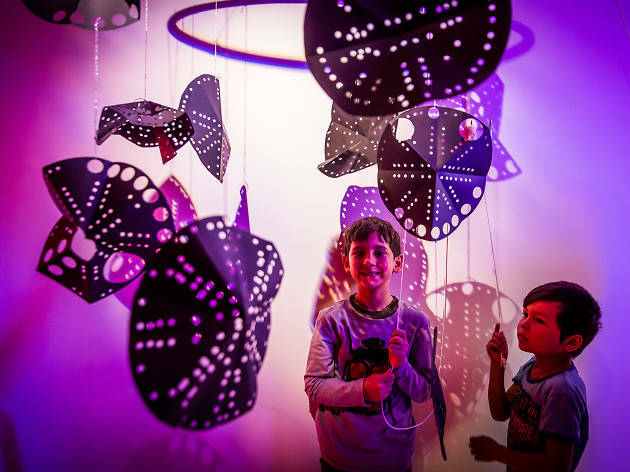 The Museum of Contemporary Art continues its mission of making art accessible to young people with a fun, playful family activity space inspired by current MCA exhibition Tatsuo Miyajima: Connect with Everything. The Tatsuo Miyajima Family Space, inside the National Centre for Creative learning up on Level 3, offers activities suitable for all ages. 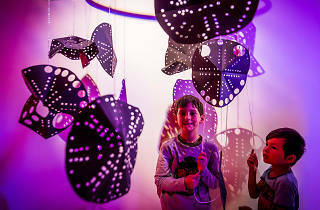 Supported by Ian Potter Foundation, this free drop-in activity space is open every weekend until March 5 and invites families to explore the three key themes from the exhibition: ‘keep changing’, ‘connect with everything’ and ‘continue forever’. When kids and carers arrive they’re greeted by a friendly MCA Host in a sparkling sequinned cloak. Using hole punches as drawing tools, they get to create a light drawing to either take home and hang in a window or to add to the growing collaborative installation, using silver string that shimmers in the blue, red and white lights. Next, it’s time to create a collaborative animation using silver magnetic strips, working with other families on the magnetic wall. Every ten seconds a digital camera takes a picture of your work and projects it on the big screen. Watch this collaborative animation grow and grow. Finally, it’s time to head into the Multimedia Studio to make music with your feet. Jump, skip, hop and bounce along lights projected onto the floor and watch a line drawing appear on the wall tracing your movement. After a few minutes you’ll notice the lights on the floor begin to fade, making way for a cluster of lotus leaves that appear to float up from beneath you. Inspired by Tatsuo Miyajima’s interest in Buddhism, you can take part in a guided meditation on a lotus leaf, led by Sydney-based artist Curly Fries. Following your guided meditation, curl up in a bean bag to read along to children’s picture books. The Tatsuo Miyajima Family Space is open daily during school holidays (Dec 17-Jan 15) and thereafter on Saturdays and Sundays, 10.30am to 4pm, except Christmas Day (the MCA is closed all day) and Sunday March 5 (the space closes at noon). The space is free, but the Tatsuo Miyajima exhibition is ticketed. Read Time Out's guide to Tatsuo Miyajima: Connect with Everything.